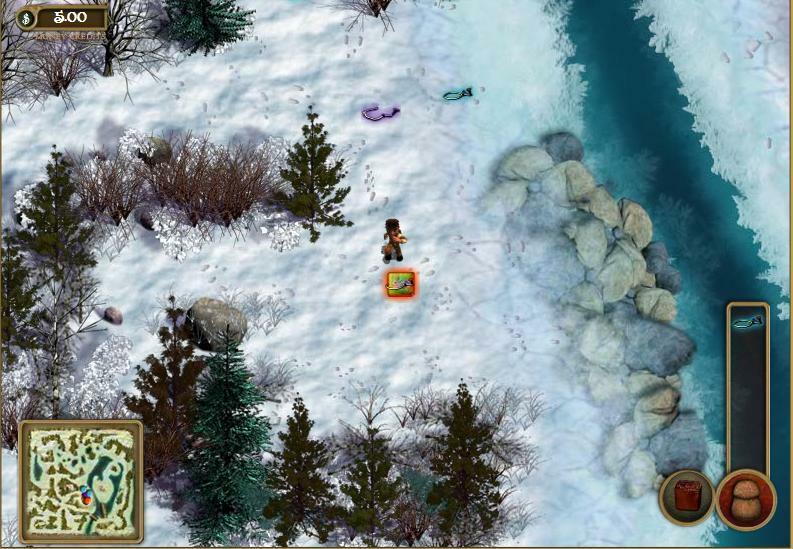 While you’re busy getting ready for the upcoming contest by playing the games at PathoftheElders.com, don’t forget to check out some of its other features! The Elders’ Stories video collection is one of the most valuable resources at Path of the Elders. Honouring the oral tradition, here you have the rare opportunity to listen to Elders share their stories and memories. Often recorded in Cree, these videos not only give you compelling glimpses into Mushkegowuk culture and history, but they are also part of our efforts to preserve and promote the Cree language. While the Elders' Stories video collection is fascinating for its content, it’s also an important record of our country's past from an Aboriginal perspective. Our Teachers’ Guides provide detailed information on how to integrate the Elders’ Video Collection into your lesson plans. This video is a fascinating glimpse into some of the challenges Aboriginal students faced in residential schools as they struggled to maintain their traditional way of life. Edmond Edwards describes having difficulty paying attention in class because he was thinking about getting ready for the fall hunt, and how it was difficult to learn English when his parents only spoke Cree. How was life different in the early 20th century? John Kataquapit describes some of the changes he's seen over his lifetime, including moving from dog teams to ski-doos, and the advent of running water. Emile Sutherland shares some of the stories his father told him about the methods his people used to combat food shortages. He talks about how everyone used to share in the food when a caribou was killed. What was life like from a woman's perspective? Anna Bella Solomon talks about her wedding, her experiences raising her siblings and her own children, and her duties towards her parents. From using game-based learning (GBL) for job training, to how Nazis used game boards as part of their propaganda campaign, here are this week’s top links! What stands out for me in these articles is the tremendous influence games have on our lives. Not only can we learn specific skills from games, but they also affect our perception of the world and ourselves. Enjoy some Friday reading, and we look forward to hearing your comments! Path of the Elders will soon be announcing the details of its upcoming contest! Make sure you’re ready to compete – visit PathoftheElders.com to practice your trapping, hunting, and canoeing skills! 1) OK, game-based learning is fine for kids, but is it really useful for adults? This is the question Helen Routledge, GBL Instructional Design Manager at Pixelearning, answers in her interview posted on G-Cube Solutions’ blog, “Game-Based Learning – Fad or Future?” Routledge talks about some of the ways game-based learning is being used in the corporate world. From the type of learner best suited to game-based learning to the challenges game designers face, this is a quick introduction for anyone interested in the use of game-based learning outside of the classroom. The Healing Game: This Week's Feature! 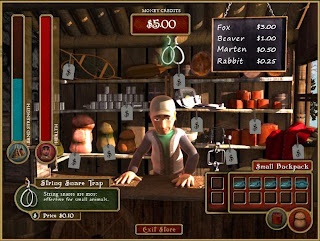 One of the most popular games at PathoftheElders.com, the Healing Game is modeled after an old-fashioned scavenger hunt! 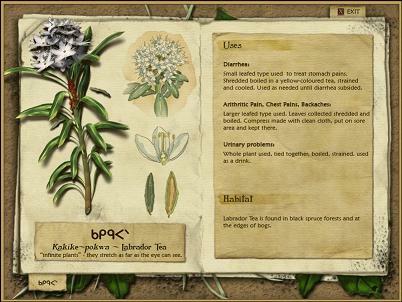 It’s up to you to collect and administer 10 traditional medicinal plants. Along the way, you must avoid dangerous animals, navigate mazes, and read Cree syllabics! An explanation of how this plant has been used in traditional bush medicine. So, as you can see from the picture below, the Cree name for Labrador Tea is “Kakike-Pokway”, which means “Infinite Plants” – so-called because they stretch for as far as the eye can see. Labrador Tea is used for treating diarrhea, arthritic pain, chest pain, and backaches! If you’re using Path of the Elders in the classroom, the Healing game is a great opportunity to talk about traditional bush medicinal and to discuss Aboriginal medicinal practices were affected by the new diseases brought by European settlers. Check out our comprehensive Teachers’ Guides for innovative suggestions for integrating the Healing Game with your lesson plans! So, are you up for the challenge? Let us know how you do! For more information, email us at info@pathoftheelders.com Created in partnership with BlackCherry Digital Media, Archives Deschâtelets, the Doug Ellis Collection at Carleton University, Our Incredible World (Pinegrove Productions), the Mushkegowuk Council, Neh Naak Ko, the Archives of St. Paul University, Carleton University, and Wendy Campbell, Educational Consultant (Learning Methods Group). Are you a teacher looking to use online games in the classroom? Interested in issues relating to education and technology? Check out this week’s top links! 1) Assessment is always a hot topic in education! In “Looking Where the Light is Bad,” J.P. Gee and D.W. Shaffer argue that we need to revolutionize the way we assess students by making tests more like games. According to them, our current forms of assessment, such as standardized testing, are no longer a relevant or accurate depiction of progress. While most papers focus on students' interaction with games, this paper takes a different approach by looking at how the teacher’s role changes with games in the classroom! It’s a bit heavy going, but if you’re interested in a different perspective on gaming and teaching it makes a fascinating read. And finally, if you're interested in all things related to gaming, education, and technology be sure to check out the 7th Annual Games for Change Festival! Have a link you would like to share? Let us know! You can find comprehensive Teachers’ Guides for grades 4-10 at PathoftheElders.com, but to get you started here are 3 easy ideas for integrating On the Path of the Elders into the classroom! 1) The Canoeing Game stresses the importance of working together while drawing attention to the historical circumstances surrounding the signing of Treaty No. 9. Before playing the Canoeing Game, use geometry to lead into a discussion about the events surrounding the treaty signing! Give each of your students a set of tangrams and ask them to create a series of specific shapes. (Click here for a tangram outline). Insist that they work on the problems individually and give them a short time limit. Once your students have failed to complete all the puzzles in the given time, divide the class into small groups and allow them to work on the problems together. Ask each group to share their results with the class. Discuss how working as a group changed the problem solving process. Explain that during the negotiations for Treaty No. 9, the government representatives approached each Aboriginal band individually. Discuss as a class how the treaty negotiations may have been different if all the bands had been able to work together. You can use the Interactive Treaty Map to guide your discussion! While you’re busy avoiding black bears and trying not to sink your canoe at PathoftheElders.com, don’t forget to check out our extensive photo gallery! Browse through pages of rare photographs of the James Bay area from the Deschâtelets Archive at St. Paul University. Are you from the James Bay area? Do you recognize any of your ancestors? Let us know what your favourite photos are! Interested in Online Games and Education? Check Out These Links! All worn out from moose hunting, trapping, and canoeing on PathoftheElders.com? Check out this week’s interesting articles on education, technology, and games! 1) Nicola Whitton’s blog about game-based learning is always a pleasure to read (Play Think Learn). This week she draws attention to a school (Quest to Learn) that has based its entire curriculum around gaming principles! 3) Deidre Kelaher explores the link between games, learning, and motivation in her blog post “The Effectiveness of Educational Gaming and the New Possibilities of Engaged Learning.” This is a fairly quick read that will give you some basic information about the benefits of using games in the classroom, and point you towards other resources. Have you come across an interesting video or article about education and technology that you want to share? Let us know! Do You Know What “Pine” Means? We ran into a problem during the creation of On the Path of the Elders: we couldn’t find the literal translation of “pine”. Maybe this doesn’t sound like such a big deal. After all, it’s just one word. But it symbolizes how much of the Cree language we have already lost. One of the goals of On the Path of the Elders is to encourage the preservation and transmission of Aboriginal language. 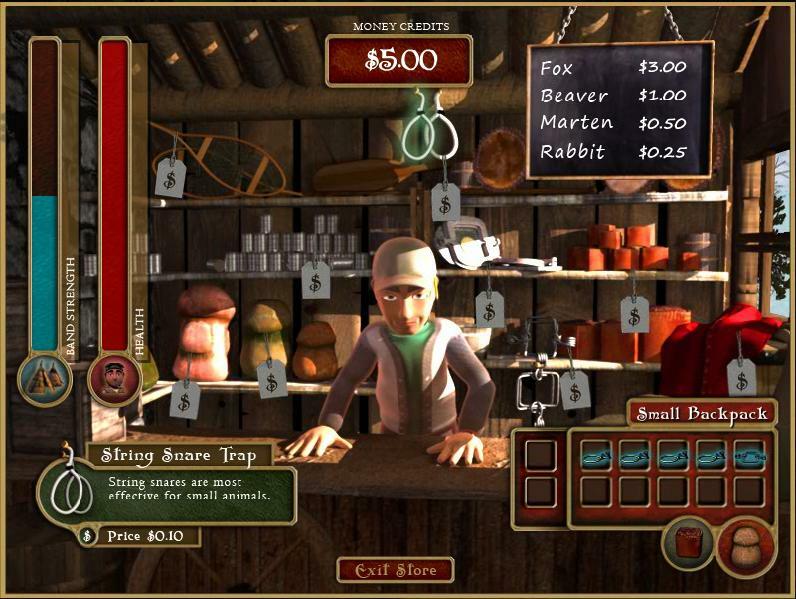 Not only do the interviewees in the Doug Ellis Audio Collection speak in their native language, but we have also integrated Cree throughout the role-playing games. For example, for medicinal plants in the Healing game both the English and Cree names are provided, along with the Cree syllabics and an English translation. So, the Cree name for Labrador Tea is Kakike-pokwa, which means “infinite plants”-- so-called because they stretch as far as the eye can see.Or Cattail is Pashekanushk, which means "exploding" because they seem to explode when they spread their seeds! But we couldn’t find the literal translation of “pine” no matter how hard we searched. Even the oldest Elder didn’t know. So sure, it’s just one word. But it’s also a reminder of the real threats facing Aboriginal language and culture. As fewer and fewer youths are taught Cree or other languages, we risk losing not only the language itself, but also a vital part of the First People’s culture. After all, language is a key part of our identity. Our words determine how we understand the world and ourselves. Through its historical resources and adherence to Mushkegowuk and Anishinaabe culture, On the Path of the Elders is more than a game: it’s an archive of the First People’s language and history. But we still need to ask ourselves what’s missing from this collection, and how can we prevent further erosion of the language in the future. Just twelve years old, Adora has published two books, been interviewed on numerous radio and television stations, and has had speaking engagements throughout the country. And as if these accomplishments weren’t enough, last February Adora gave an impassioned and provocative speech at the TED 2010 conference, a prestigious event reserved for the world’s foremost thinkers and doers. Standing alone in front of an audience filled with eminent scientists, artists, politicians, and intellectuals (the majority of them more than twice her age) she is calm, poised, and articulate -- a task most of us would find daunting. In fact, the thought of giving a speech in front of a uniformly brilliant international audience at an event renowned for its intelligence and creativity is enough to make most of us want to crawl back into bed and pull the covers over our heads. It is this fear, these self-imposed restrictions, that Adora’s speech addresses. She argues that adults need to learn from kids because kids haven’t yet learned to be rational. Kids are risk takers. They want to explore and learn. They haven’t learned to be afraid of failure. They haven’t learned to be afraid of taking the stage and voicing their ideas – until we teach them. Of course, experience is vital. We need to grow up. A society of utterly naive and overly idealistic adults is as disturbing and dangerous as one full of hyper-rational and restrictive adults. However, Adora’s argument that adults and kids have things to learn from each other is important. We need to help kids gain the experience they need to be responsible and contributing adults, and we need to learn from kids how to dream. It’s up to us to develop an education system that encourages kids to gain experience without losing their drive to achieve the impossible. After all, that’s who many of the speakers at TED are: adults who have refused to give up the capacity to imagine. All too often we shape our dreams to fit reality, when what we really need to do is shape reality to fit our dreams. Education is constantly in flux. How should technology be integrated into the classroom, what is the best way to assess a child’s learning, is social media a help or hindrance to participatory learning – these are just some of the questions that struggling with. During the creation of On the Path of Elders, we were constantly trying to find ways to empower students and to encourage exploration, rather than risk aversion. But sometimes it’s refreshing to have a reminder of what we’re struggling for: while not every child may be a published author, mathematical genius, or musical prodigy, Adora Svitak represents future generations of citizens who are confident, hard-working, thoughtful, sincere, and passionate. If we dare to dream it. What Does New Media Mean for Oral Traditions? Video and audio clips are just one of the ways On the Path of the Elders seeks to reinforce the Aboriginal tradition of oral history. In addition to the extensive video and audio collection, On the Path of the Elders’ role-playing game (RPG) encourages players to learn from their Elders through conversations and observation. 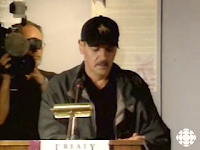 Furthermore, the difference between the government and the Aboriginal’s view of the spoken word is highlighted in the Negotiating Game, where the player renegotiates the signing of Treaty no. 9. Through each of its features, On the Path of the Elders is committed to celebrating the oral tradition. Indeed, one of the site’s original purposes was to provide a familiar space where youths could listen to and learn from their Elders. But what does it mean that we’re blending oral tradition with new media? The chosen method of transmitting knowledge throughout generations reflects a community’s fundamental values and beliefs. Are you looking for innovative ways to connect your students to Aboriginal culture and history? While creating On the Path of the Elders, we found a surprising lack of interactive online resources for educators trying to integrate Aboriginal content into the classroom. While there are numerous excellent websites devoted to providing information about various issues relating to First Nations, few sites try to engage directly with Aboriginal or non-Aboriginal youths. Have you noticed there is a surprising overlap between early epic (quest-based) video games and Victorian Gothic novels? If you’re unfamiliar with the Gothic genre, think Dracula or Frankenstein. They usually involve some dark -- often supernatural -- force that lurks below the surface. They’re the stories that make you feel a little uneasy; they’re the stories where the world is just a little bit dark. No, epic video games are not all about vampires or zombies (although they might be!). It’s not in the content that epic video games overlap with Gothic novels, it’s in their shared nostalgia for an idealized past. This is the revolutionary but easily overlooked statement Jane McGonigal makes during her Ted talk on how gaming can make a better world. Notice that she doesn’t say, “We have to start using gamers’ skills in the real world,” or “we need to figure out how gaming relates to real world activities”. No. She says we need to start adapting our society to compliment the values and beliefs of gamers. It’s not about bringing gamers into the real world; it’s about bringing the real world in line with gaming. How Can Gaming Save the World? After launching On the Path of the Elders last week, it was rewarding to listen to McGonigal’s compelling talk. Not only does she reconfirm the value of gaming, but -- more importantly -- her argument speaks to many of the ideals at the heart of PathoftheElders.com. McGonigal argues that gaming develops skills and beliefs vital for solving some of the world’s biggest challenges. In particular, she claims that gaming produces individuals with a strong conviction that they are capable of changing the world. Too often, however, these individuals limit their influence to a virtual landscape. As game designers, educators, and role-models it is up to us to convince these gamers that their skills have real value: the same optimism, team-work, resourcefulness, and determination that makes gamers successful in online worlds can and must be brought to real world problems. But how much difference can gamers make? Today, the average youth in a country that has a large gaming culture will have spent 10 000 hours playing online games by the age of 21 (to put that number in perspective, they will have spent 10 080 hours in school between grades 5 and 12). Globally, we spend 3 billion hours a week playing online games. There are currently 500 million virtuoso gamers (defined as people who have spent at least 10 000 hours gaming). In other words, the number of highly skilled gamers is increasing exponentially. If we don’t start figuring out how to use gamers’ abilities to solve real world problems, we’re wasting a huge resource. By promoting leadership, negotiation, and decision-making skills, PathOfTheElders.com will demonstrate to players that they have the ability to become advocates for change. We want youths to recognize their connection to a rich and vibrant culture, and realize that the skills they use in the role-playing games are the same skills needed to be leaders in their communities. Building PathoftheElders.com has been an intense, challenging, and thought-provoking journey. Speakers like Jane McGonigal remind us why we have invested so much of ourselves in this project and what might be its rewards for future generations. Launch Party for PathoftheElders.com a Success! The public launch of PathoftheElders.com on Wednesday, March 24th was celebrated by the project’s collaborators and select members of the public at Carleton University’s Art Gallery. Speakers included Mr. John Mark Seck, president of BlackCherry Digital Media; Stan Louttit of Neh Naak Ko; Greg Spence of the Mushkegowuk Council; Dr. Kimberly Matheson, Carleton University Vice-President (Research and International); Franziska von Rosen of Our Incredible World (formally Pinegrove Productions); Dr. Elaine Keillor and Dr. John Medicine Horse Kelley Cle-alls, co-directors of Carleton's Centre for Indigenous Research, Culture, Language and Education, known as CIRCLE. Each of the speakers spoke with a passion and intensity that demonstrated their deep commitment and dedication to PathoftheElders.com. Dr. Cle-alls performing a opening prayer. Mr. Louttit vividly describing his own experiences growing up, and the need to give today’s youth access to Aboriginal perspectives on history. Ms. von Rosen recounting with obvious emotion the experiences she and her team had while interviewing and recording Elders for the website. Dr. Cle-alls giving an impassioned speech about the disconnect in Aboriginal communities that has arisen as a result of disastrous colonial interventions such as residential schools, and the need for resources such as PathoftheElders.com to show Aboriginal youths that they are part of a deep and meaningful tradition and culture. Mr. Seck unveiling the site’s stunning graphics and high-quality animation to a captivated audience. But what was most striking about the launch party was the vision everyone was carrying for the future. It was clear that each person at the launch believed PathoftheElders.com will make a difference in helping Aboriginal youths reconnect with their culture and history. And of course, during the reception everyone was eager to play the role-playing games, and explore the archival photographs, watch the videos, and listen to the audio clips! Visit PathoftheElders.com today and let us know what you think! On The Path Of The Elders Launches Today! We’re pleased to announce the launch of PathOfTheElders.com! PathOfTheElders.com is a free online educational resource exploring the culture and history of the Mushkegowuk Cree and Anishinaabe Ojibway of Northwestern and Northeastern Ontario, and the signing of Treaty No. 9. Ideal for youth aged 13-17, PathOfTheElders.com reconnects Aboriginal youths with their past, while developing leadership, negotiation, critical thinking, and decision-making skills. 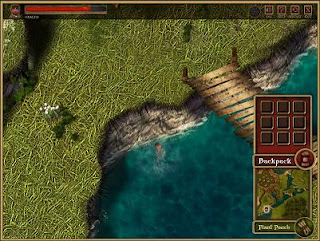 Check out On the Path of the Elders at pathoftheelders.com! Reading my previous post, you may have come to the conclusion that I am against the concept of winning in game-based learning. Winning defines the majority of our lives: we’re always struggling to achieve our own definition of success, whether that means getting a B- instead of a C, completing a project ahead of schedule, or having the courage to push for a sale. At its best, winning creates a sense of mastery; it shows what you are capable of achieving; it demonstrates you have the ability to develop and sharpen your skills. There must be a rational and significant link between what you do and how and what you win. You may remember my first post discussed how game-based learning gives students freedom from failure. So I think it’s time we talked about winning. Even if you haven’t played them, you’re probably familiar with some of the past year’s most successful games, such as Farmville, Mafia Wars, Club Penguin, Webkinz, and Wii Fit. Prof. Schell argues that each of these games crosses the boundary between reality and fantasy. The player is encouraged to invest money, compete with friends, or perform physical activities to play the game. Most significantly, Prof. Schell mentions a case where Lee Sheldon, a professor at the University of Indiana, gives his students “experience points” instead of grades. Consequently, Dr. Sheldon has seen increased class attendance and participation and higher quality work. In other words, gaming increasingly affects our actions in real life. Game-Based Learning: Revolutionary or Reactionary? Do you “walk and use your feet” to get to work? Do you “work and write a report”? Of course not. The “and” is self-evident. So why do we use phrases like “education and technology” or “education and gaming”, as though gaming, technology, and education were entirely separate? Why does education carry around this “and” like its very own force field? In other words, there is a direct link between self governance and lower suicide rates. In other words, role-playing games shifts the power in the classroom: educators are able to act as facilitators, rather than directors. How Can Online Gaming Foster Positive Self-Identity? This was one of the questions we faced while creating On the Path of the Elders -- a free, online educational resource that explores Cree and Ojibway history and culture, in particular the signing of Treaty no. 9. In 2008, the Educational Policy Institute submitted a report concerning Canadian Aboriginal Self-Identification. It states, “Canada’s Aboriginal population grew 45 percent in the past decade and now exceeds one million people, comprising 3.8 percent of the nation’s population. This population surge can be accounted for in two ways: the high birth rates of Aboriginal people and a population that is increasingly choosing to self-identify as Aboriginal” (emphasis added). So, at a time when more people than ever are choosing to self-identify as Aboriginal, the suicide rate amongst Aboriginal youths is sky-rocketing. We wanted On the Path of the Elders to have an effect on this appalling suicide rate, and we thought an online role-playing game would be a relevant way for youths to celebrate and explore their culture. Even though youths are increasingly using the Internet for socialization, education, and entertainment, there are surprisingly few quality online resources aimed at aboriginal youths. 3) and, of course, it had to be fun. In other words, On the Path of the Elders had to re-conceptualize what it meant to connect education and technology. 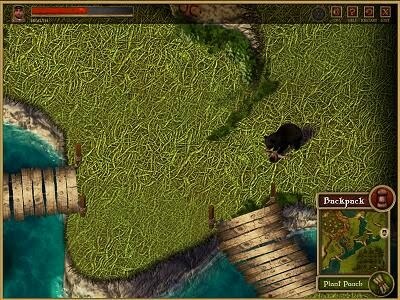 On the Path of the Elders is a significant (and entertaining) game. It allows youths to freely explore different facets of Cree and Ojibway culture, to drive their own narrative, and to take control of their own learning process. The website contains a rich archive of historical and cultural materials. Archival photos, historic audio recordings, video interviews with Elders and a detailed essay examining the treaty from an Aboriginal perspective, all enrich the user’s experience. On the Path of the Elders is revolutionary, and a groundbreaking resource for both Aboriginal and non-Aboriginal students. We hope that On the Path of the Elders is only the first of many such educational games and online resources that help youth explore their culture in a positive, entertaining manner. Have you come across any online resources you’d like to share? We’d love to hear from you! 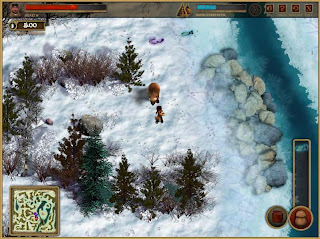 On the Path of the Elders launches March 24, 2010. Check it out at pathoftheelders.com. Created in partnership with the Mushkegowuk Cree, Carleton University, BlackCherry Digital Media, and Pinegrove Productions. One of video gaming’s attractions is that you are free to fail: in fact, you’re encouraged to fail! How much fun would a game be if the first time you played it you, you won? Instead, your character dies and you re-start, the time runs out and you miss slotting in that last puzzle piece, or you can’t think of the answer quick enough and you’re back to zero. This freedom to fail is often mentioned as one of the benefits of educational games. Students are encouraged to discover solutions in a safe environment. But do games really offer freedom from failure? And is that what we want? If you’re an educator, you’re probably aware of the current debate surrounding the “no-fail policy”. Some regard the no-fail policy as the latest step in sacrificing education for feel-good programs; others argue that it promotes greater learning by avoiding burdening students with a stigma early on in their education. Whether or not you support it, the no-fail policy is an indication of how prevalent the notions of “pass” and “fail” are in both the school system and in larger society. And perhaps nowhere is the subject of passing and failing stronger than in Aboriginal education. In 2008, the Educational Institute published a report stating, “2001 Census numbers showed that nearly 59% of on-reserve Aboriginal people and 44% of off-reserve Aboriginal people have not graduate high school, compared to 31% of the population as a whole”. Similarly, the Council of Ministers of Education states in the overview of the Aboriginal Education Action Plan, “Aboriginal students, both male and female, perform at lower levels than other students”. In a system that lauds the idea of passing and failing, our Aboriginal students are being failed. So, how does this relate to video games? The education system is built around preset definitions of “pass” and “fail”, to the point where success has become a synonym for pass. Games redefine what failure means. In fact, using words like “fail” when it comes to gaming shows how far we still need to go: we don’t yet even have the vocabulary to talk about gaming outside of this pass/fail duality. But when a character dies in a game, when you don’t quite fit that puzzle piece, when you need to re-start the game four hundred and ninety-nine times (knowing that you’ll probably need to re-start it that five hundredth time! ), that’s not failing. It’s learning how to learn. It’s finding out something integral about you, something relating to determination, hard work, and perseverance. Of course we need to focus on making sure students pass. Of course we need to make sure students are being given the ability to succeed. But perhaps we also need to show them that they can redefine what passing and failing mean. Online games give students – even if only temporarily – the ability to exist outside the continuum of pass/fail. And perhaps that freedom is needed as much, if not more, than a no-fail policy which simply refigures where the students sit on the same old continuum.